The sun has peeked its head, the children are making their way to the playground, vacations are being planned, your car is finally getting washed. When you clean your windows and change out the closets, consider cleaning out the clutter in your personal space. Spring is the perfect time to detangle yourself from some of the people and things that may occupy your spaces and places. · Think of 5 people in your immediate circle. Are they adding to your "joy jar" or taking from it each day? · Are your friends telling you what they think you want to hear or what they know you need to hear? · Are you already super happy and simply are wanting spring to jump start your next phase of awesomeness? Well, COME ON IN SPRING! Check out this S.P.R.I.N.G. 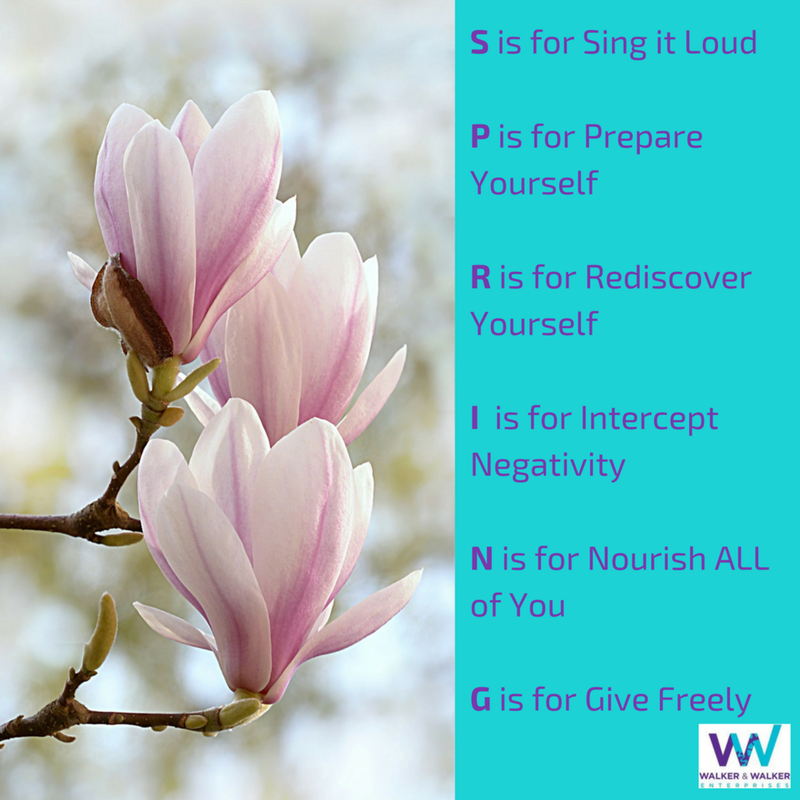 acronym to spring you into something new! I am a conqueror. I am beautiful. I am power. I deserve any and every blessing that is coming my way. Start with a deep breath in and a deep breath out each morning as you wake. Consider modifying your morning routine to include gratitude and an affirmation to yourself, FOR YOURSELF. Be specific, intentional, and driven towards your core strengths and the greatness of where you want to be. Don't know where to start? Grab a powerful, personal, & poetic affirmation designed just for you. 2. Prepare yourself for the breakthrough that is headed straight your way. Start with removing distractions from your space. Avoid getting caught up in what is not progress you forward. It oftentimes seems easier said than done BUT it doesn't have to be. YOU GOT THIS! Be clear on your goals. If people or things are obstructing your path to achieving those goals, classify them as a distraction. Move them to the sidelines and keep forging ahead. When you reach your end destination, you can then decide if they remain on the sidelines or if you allow them into your new space. Rediscover what you love to do, THEN do it. Here's a little exercise. Grab a sheet of paper, position it horizontally, and divide it into five columns. Column 1: Write down 3 things you are doing when you are at your happiest. Column 2: Write down the month and year of the last time you recall doing each of the 3 activities. Column 3: Write down what obstacle or fear is holding you back from doing each activity more regularly. Column 4: Write down what you can do to conquer each obstacle or fear. Column 5: Write down a month THIS YEAR that you will plan to do each activity. Create a calendar event for yourself to "just do it." Finally, take a photo of your list and send it to 2 people that you know will support you in getting it done. Accountability drives action! Shut negativity down by intercepting it before it knocks at your door. Your space is sacred and must be protected with what you deem is appropriate to bless it with. Negativity has no place within your journey. Disrupt your normal and hang your positive affirmations, your goal, and your plans for you to see on a regular basis. Stay focused and positive in getting there. 5. Nourish all of you. Hmmmm, can one of the activities you listed in #3 (Rediscover Yourself) help you nourish your mind, your body, or your soul? Are you reading, attending training's, and growing your mind? Are you feeding your body fruits, veggies, grains, and other power foods? Are you taking time to invest in you and what feels good to your soul? Looking for an amazing way to do all 3? Join me for a 2.5 day, all-inclusive renewal & rejuvenation of wellness, cooking, meeting new people, workshops to shift your thinking, dlounging by the pool, and simply rediscovering you! 6. Give of yourself freely. Although you may not yet be in the position you desire for your future, you have so much to be grateful for. Give of yourself freely and without reservation because to "pay-it-forward" may really go a long way for someone in need. Someone did It for you. Give of yourself and be amazed at the blessings that pour down in your favor. Sign up to get the lastest information on services, discounts, blogs, new products and so much more! I Am Ready to Board! Thank you for trusting me to walk with you on your journey!